Once you launch the tool and pass the license verification process, you see the Disk and image scan options window where you can specify which devices should be displayed and what partitioning schemes should be parsed. Show unreadable drives (capacity 0). Note that marking Show unreadable drives does not allow to read such a device. This parameter is implemented mainly to diagnose driver compatibility problems and to confirm physical damage or firmware damage on the device. 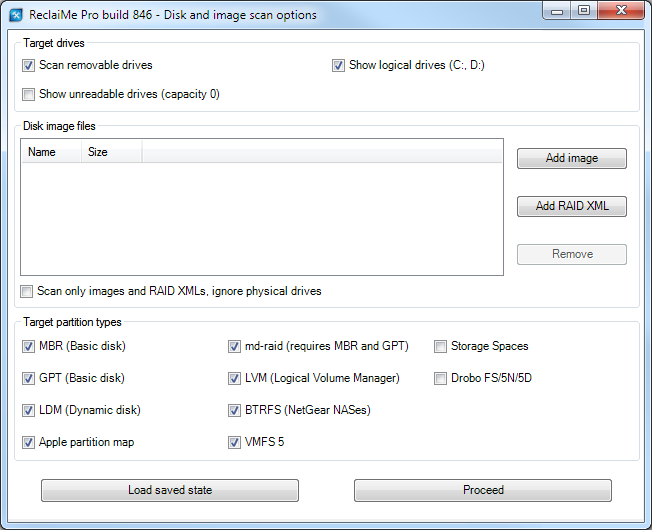 Under the Disk image file section you can specify the desired partition schemes ReclaiMe Pro should search the devices for during the initial scan. When scanning md, it is recommended to mark GPT and MBR. Similarly, LVM needs MBR, GPT, and md. However, in practice all combinations are possible that is why no hard limitations are implemented and you can still mark, say, only md ignoring MBR and GPT. Once you set all the necessary parameters and click Proceed, ReclaiMe Pro starts searching the devices for the specified partition schemes. ReclaiMe Pro provides you information on what it is doing at any given time (Activity) with a particular device (Affected): open a device, scan it for partitions, and so on. Thus, in case of any abnormality, you can easily identify the affected device and what the problem is. So if you know for sure that there are no certain partition types on the device, you can exclude them at this stage and save the recovery time.